When the ventilator assumes the entire work of breathing, and the patient's respiratory muscles are inactive, a risk exists that inactivity of the diaphragm leads to disuse atrophy of the respiratory muscles. In animal studies, passive ventilation has been shown to induce detrimental effects on diaphragm muscle function [3-6]. In sedated and paralyzed baboons, transdiaphragmatic pressure and endurance decreased significantly after eleven days of controlled mechanical ventilation . In anesthetized rats, two days of controlled mechanical ventilation reduced diaphragm muscle force-generating capacity by 42% compared with control animals breathing spontaneously . A recent study demonstrated also that the reduction in diaphragm force-generating capacity with controlled mechanical ventilationwas time dependent and that the injury to the muscles accounted for the reduction in diaphragm muscle force . How much these experimental data apply to patients and whether experimental data are able to reproducing the clinical situation of patient-triggered ventilation is difficult to determine. The available data, however, constitute an important incentive for the clinician to avoid or minimize fully controlled mechanical ventilation. Despite the fact that the supposed role of controlled ventilation (as set on the ventilator) is to take over all the work of breathing, it is important to realize that the patient can still produce active work during controlled mechanical ventilation, provided that no pharmacological paralysis is used . Depressing the respiratory drive with sedationusually turns down the active work ofbreathing, but persistence of major metabolic abnormalities and of lung injury constitute important stimuli for the respiratory centers. Applied minute ventilation, through settings of tidal volume (Vt) and respiratory rate, is a major determinant of the respiratory drive and of the adaptation of the patient to the ventilatory conditions [7, 8]; indirectly, it will determine the amount of sedation that the clinician judges necessary to keep the patient comfortable. Proper adjustment of the sedation level to minimize its side effects has important clinical consequences, especially on the duration of mechanicalventilation . 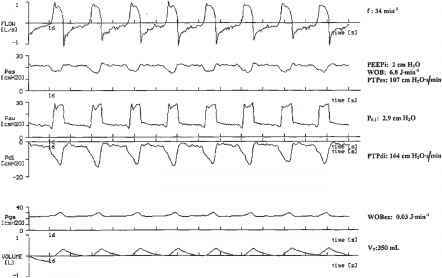 Whether someventilatorymodes allowingspontaneous breathing superimposed on standard ventilatory settings facilitate the use of lower levels of sedation, has already been suggested, but will need to be tested in further studies .